Snickerdoodle Street "Battat Catalog Scans 1998/99"
Toybox Philosopher, "More Minis! Part 2: Collector's Lane Kids by Battat"
These were Target's low-cost alternative to American Girl dolls. 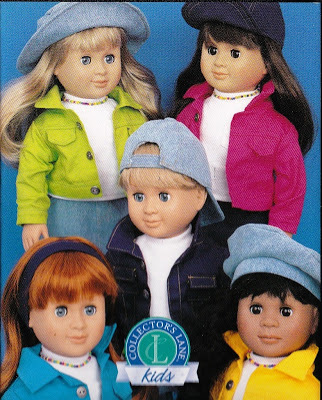 The Collector's Lane Kids were the equivalent of the American Girl of Today line (contemporary) and the Collector's Lane Classic were the equivalent of the AG historical characters. There are some products (mostly furniture) that are just labeled "Collector's Lane" (or "Collectors Lane"). This brand morphed into Our Generation around 2000.